CADASTRAL ZONE 08-04, MPAPE II LAYOUT, ABUJA. The Council of Akwa Ibom Traditional Rulers and Religious Leaders in the Federal Capital Territory, Abuja of Akwa Ibom State People in the Federal Capital Territory, Abuja is one of the Traditional Rulers Council of the 36 States of the Federal Republic of Nigeria in the Federal Capital Territory, Abuja. The Council was inaugurated by the former Governor of Akwa Ibom State, His Excellency, Arch. Victor Attah, who was represented by the then Permanent Secretary/Liaison Officer, Government of Akwa Ibom State, Akwa Ibom Liaison Office, FCT, Abuja, Chief Joe Udobia. The Akwa Ibom State Government during the inauguration also gave a take off grant of N500,000.00 to the Council in the FCT. The Council of Akwa Ibom Traditional Rulers was constituted to serve the purpose and functions of Traditional Administration and Rulership of Akwa Ibom people in the Federal Capital Territory, who together with the people of Nigeria from the other States which make up the Federal Republic of Nigeria, are co-equal owners and citizens of the Federal Capital Territory, Abuja in consonance with Section 297(2) which vest the ownership of all lands in the FCT, Abuja in the Federal Government of Nigeria comprising all Nigerians from all the States of the Federation. The Council was specifically constituted to meet the vacuum arising out of the creation of the FCT Council of Chiefs by the Federal Government via the Chiefs (Appointment and Deposition) Laws of the Federal Capital Territory, 1997 which vest the Council with the functions of advising government on the matters of Tradition, cultures and values of the people of Nigeria in the Federal Capital Territory, intercultural and interethnic relationship for peaceful co-existence, security matters and traditional public enlightenment issues, amongst others. (f) Mobilizing Akwa Ibom people in all the Villages, Districts and Area Councils of the FCT to participate in governance in the FCT and indeed the nation and benefit from government programmes and projects while contributing their quota to national development. Pursuant to these Mandates, this Council had commence the process of facilitating the election and selection of Akwa Ibom Traditional Rulers in the FCT in accordance with Akwa Ibom native laws, traditions, customs and usages and presented same to the FCT Administration for the purposes of enabling the Minister of the Federal Capital Territory to exercise the powers conferred on Him by Section 11 of the FCT Traditional Rulers law which requires the FCT Minister to direct the Director of Local Government in the FCT Administration, to issue official certificates of recognition to Traditional Rulers which are appointed/selected according to the traditions, customs and native laws of the people of Nigeria in the FCT and to grade them accordingly. (4) Akwa Ibom Religious Leaders of Episcopal or Apostolic ranks and the General overseers of CAN recognized churches in the FCT. The Joint Council has embarked on a programme of Teaching our Children how to effectively speak, write and read our Language and Dialects during Public Holidays which is being expanded to reach all the Districts in the FCT, Abuja. His Royal Majesty, OBONG (DCG) ESSIEN E. NKANG, Rtd. SUBMISSION OF NAMES OF TRADITIONAL RULERS/CHIEFS OF AKWA IBOM STATE PEOPLE IN THE FEDERAL CAPITAL TERRITORY, ABUJA FOR OFFICIAL RECOGNITION AND APPOINTMENT INTO THE FCT COUNCIL OF CHIEFS, ABUJA. THE CONSTITUTION OF AKWA IBOM STATE PEOPLE IN THE FEDERAL CAPITAL TERRITORY, ABUJA. The Ibibio people are Jews from the Northern Kingdom of Israel who migrated to Egypt during the travail proceeding the Babylonian captivity and further migrated to Ethiopia, Sudan and Cameroun to settle in Usak Edet near the Cameroon Maintain before spreading to the present places in Southern Nigeria and Cameroon in Africa. The Ibibio people are blood relations of the Annang, Oron and Efik Races Akwa Ibom State and Bakassi people of Cross River State in Nigeria and the Cameroon. Ibibio people are also found as native people in the countries of Cameroon, Ghana, Sudan, Equatorial Guinea, etc. The Oron people are comprised in five Local Governments of Akwa Ibom State and in Bakassi Local Government Area of Cross River state. The Ibibio Race/Nation are the Fourth Largest Ethnic Group in Nigeria and the 1st Largest Ethnic group in Akwa Ibom State comprising 18 (eighteen) Local Government Areas of Akwa Ibom State. The Ibibios live in Southern, North-Eastern and Northwestern areas of Akwa Ibom State. The Ibibio Traditional Society is made up of a nuclear family of a man and his wife or wives and the children known as the "ufok" who combine with other "ufoks" with blood affinity to form the extended family or hamlet which are known as "ekpuk". Various Ekpuks with blood relationship combine to form a Village known as "Idung". Several Idungs combined to form a clan which is called "Obio". Several Obios make up a Local Government Area. Several Obios (clans) of the Ibibio which close blood affinity (iman) joined to become the various "Essien Ibibio" the Houses of the Tribes of Ibibio which cuts across all the 18 Local Governments of Ibibio land. The Traditional System of Administration and Rulership in Ibibio Land comprised of the ancient system, the present statutory system and the reformed traditional system. In the Traditional Ibibio society, the autonomous Communities of the Ibibio Land was ruled an Obong Ikpaisong "Rulers of the Land and the Host or Principalities of the Land". The Obong Ikpaisong stool/throne in Ibibio land is the combination of the sacred Office of Priest and Kingship. The Obong Ikpaisong is a Priest-King and performed both functions in the autonomous communities of the Ibibio Land within the Obios of his jurisdiction. The Obong Ikpaisong ruled with the Mbong Idung (village heads) and the Mbong Ekpuks (family Heads) together with the Leaders/mbongs of the various traditional societies such Obon, Ekpe, Ekpo, Nnabo, Agatha, Anyamkpe, Ekoong, etc. The various autonomous communities of the Ibibio collaborate and joined together with other Ibibio brothers known as iman to protect their common interest and defeat common enemies. 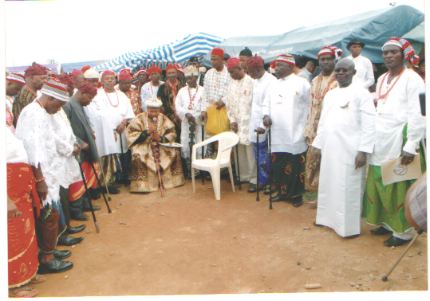 In the reformed Traditional Administration of Ibibio land, all the Paramount Rulers of Ibibio Land united in one umbrella known as Ifim Ibibio to constitute the Supreme Council of traditional Rulers in Ibibio Land with a Supreme Traditional and Priestly Monarchy Throne or Stool called "Oku Akwa Abasi Ibom Ibibio" which means "the Priest of the Almighty God of the Ibibio" and shortened as "Oku Ibom Ibibio". The Oku Ibom Ibibio is the Supreme Traditional/Priestly monarch of the Ibibio race/nation in Akwa Ibom State. In the modern statutory traditional system of Ibibio Nation in Akwa Ibom State, the Ibibio Traditional System of Administration comprised of a Paramount Ruler for every local Government who ruled with Clan Heads, the Villages Heads and the Family Heads. The Family Heads are known as Mbong Ekpuk, the Village Heads are known as Ete-Idung which the Clan Heads are known by the Traditional Titles and Offices in which their stools and thrones were known from the ancient times. The paramount Rulers are also known by the Traditional Titles and Offices in which their Offices were known from ancient times. The Ibibio people have a unique cultural system. The Ekpe, Obon, Ekpo and Anyamkpe Societies were used thorough out Ibibio land as an authority of traditional laws enforcement. There are other traditional societies in Ibibio land which include the Abang, Ekon, Agata, Ekid, Awad Atang, Nnabo and many others. The Ibibio people have a very colourful mode of traditional dressing which include a white designer lace material worn with a wrapper which could be Georges, Hollandise, etc to match. There is a symbolic Ibibio Hart with various designs to cap the unique dressing of the Ibibio people. The Annang people like their Ibibio brothers, are Jews from the Northern Kingdom of Israel who migrated to Egypt during the travail proceeding the Babylonian captivity and further migrated to Ethiopia, Sudan and Cameroun to settle in Usak Edet near the Cameroon Maintain before spreading to the present places in Southern Nigeria and Cameroon in Africa. The Annang people are blood relations of the Ibibio, Oron and Efik Races of Akwa Ibom State and Bakassi people of Cross River State in Nigeria and the Cameroon. Annang people are also found as native people in the countries of Cameroon, Ghana, Sudan, Equatorial Guinea, etc. 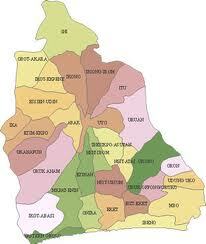 The Annang people are comprised in Eight Local Governments of Akwa Ibom State. Traditional history has it that their ancestors were Israelis (Jews) who left Israel to Egypt and intermarried with the Egyptians and were pushed through various wars and conquests southward into the Sahara Desert. They moved across the desert and some of them settled in the upper west African Region at 7500bc. Remnants of their language according to Waddel can be found amongst middle-east. Migration brought groups of the Annangs to live amongst the Twi people of Ghana where the name Annang means the fourth son. From Ghana, the group moved eastward into present day Cameroon. It was in Cameroon highlands that some of the Annangs broke off but later arrived at the same territory in the Coastal Southern Nigeria. The Annang Race/Nation is the 2nd Largest Ethnic group in Akwa Ibom State comprising Eight (8) Local Government Areas of Akwa Ibom State. The Annang Traditional Society is made up of a nuclear family of a man and his wife or wives and the children known as the "ufok" who combine with other "ufoks" with blood affinity to form the extended family or hamlet which are known as "ekpuk". Various Ekpuks with blood relationship combine to form a Village known as "Idung". Several Idungs combined to form a clan which is called "Obio". Several Obios make up a Local Government Area. Several Obios (clans) of the Ibibio which close blood affinity (iman) joined to become the various "Essien Annang" the Houses of the Tribes of Annang which cuts across all the 8 Local Governments of Annang land. These Essien Annang include Eka Abiakpo, Afaha, Ika, Ukana, Nto Edino amongst others. The Annang Society is Patriarchal. The individuals locate their place in the social world from the Idip which literally means womb. Thus a brother or sister from the same Idip means that they can trace their origin to the same mother or father. Leadership at the family, lineage, village and clan levels remained the prerogative of the men and lineage ties extend to the women even after marriage. The Traditional System of Administration and Rulership in Annang, like their Ibibio brothers comprised of the ancient system, the present statutory system and the reformed traditional system. In the Traditional Annang society, the autonomous Communities of the Annang Land was ruled an Obong or Obong Ichong "Ruler or Ruler of the Land" which was also known as Nkuku. The Obong or Obong Ichong stool/throne in Annang land is the combination of the sacred Office of Priest and Kingship. The Obong Ichong or Nkuku is a Priest-King and performed both functions in the autonomous communities of the Ibibio Land within the Obios of his jurisdiction. The Obong or Nkuku ruled with the Mbong Idung (village heads) and the Mbong Ekpuks (family Heads) together with the Leaders/mbongs of the various traditional societies such Obon, Ekpe, Ekpo, Nnabo, Agatha, Anyamkpe, Ekoong, etc which constituted the Afe Isong. The various autonomous communities of the Annang collaborate and joined together with other Annang brothers known as iman to protect their common interest and defeat common enemies. 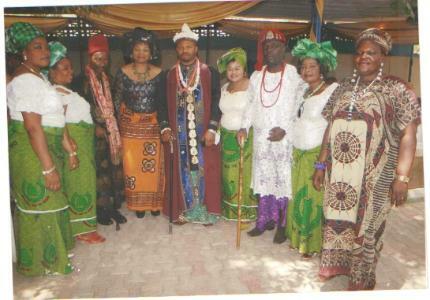 In the reformed Traditional Administration of Annang land, all the Paramount Rulers of Annang Land united in one umbrella known as Afe Annang to constitute the Supreme Council of traditional Rulers in Annang Land with a Supreme Traditional and Priestly Monarchy Throne or Stool called "Nkuku Annang" which means "the Priestly Traditional and Spiritual Ruler of Annang". The Nkuku Annang is the Supreme Traditional/Priestly monarch of the Annang race/nation in Akwa Ibom State. In the modern statutory traditional system of Ibibio Nation in Akwa Ibom State, the Annang Traditional System of Administration comprised of a Paramount Ruler for every local Government who ruled with Clan Heads, the Villages Heads and the Family Heads. The Family Heads are known as Mbong Ekpuk, the Village Heads are known as Ete-Idung which the Clan Heads are known by the Traditional Titles and Offices in which their stools and thrones were known from the ancient times. The paramount Rulers are also known by the Traditional Titles and Offices in which their Offices were known from ancient times. The Annang people have a unique cultural system. The Ekpe, Obon, Ekpo and Anyamkpe Societies were used thorough out Oron land as an authority of traditional laws enforcement. There are other traditional societies in Annang land which include the Abang, Agata, Ekid, Nnabo and many others. The Annang people have a very colourful mode of traditional dressing which include a white designer lace material worn with a wrapper which could be Georges, Hollandise, etc to match. THE HISTORY AND SYSTEMS OF THE ORON NATION/RACE OF NIGERIA. The Oron people are Jews from the Northern Kingdom of Israel who migrated to Egypt during the travail proceeding the Babylonian captivity and further migrated to Ethiopia, Sudan and Cameroun to settle in Usak Edet near the Cameroon Maintain before spreading to the present places in Southern Nigeria and Cameroon in Africa. The Oron people are blood relations of the Efik, Ibibio and Annang Races Akwa Ibom State and Bakassi people of Cross River State in Nigeria and the Cameroon. Oron people are also found as native people in the countries of Cameroon, Ghana, Sudan,etc. The Oron people are comprised in five Local Governments of Akwa Ibom State and in Bakassi Local Government Area of Cross River state. The Oron people are the third largest ethnic group in Akwa Ibom State comprising five local governments of Oron, Udung-Uko, Mbo, Urue-Offong/Oruko and Okobo. The Oron people popularly called "Oro Ukpabang" or "Akpakip Oro" by her indigenes are made up of several clans which are called "Afaha" namely: Afaha Okpo, Afaha Ukwong, Ebughu, Afaha Ebighi, Effiat, Afaha Ubodung, Etta, Afaha Ekiuso and Afaha Idua (Iluhe). Traditionally, the Oron people have a King that rules over the Oron race and lands. The Oron monarch is known as "Ahta Oro". The Ahta Oro has all the Ofong (Ivong or Ifong) Afaha and all the Paramount Rulers of the Oron Local Governments as Members of his Traditional Rulers Council. 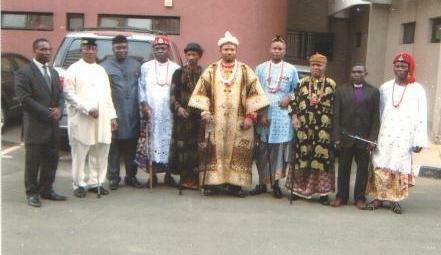 Some high Chiefs such as Ikpoto, Akpha and Okete Okete are also recognized by the "Ahta Oro"s Council of Chiefs. The President-General of the Oron union worldwide is regarded as the Administration head of the oron race and second-in-command to the Ahta-Oro. The Oron people have a unique cultural system. The Ekpe Society was used thorough out Oron land as an authority of traditional laws enforcement. There are other traditional societies in Oron land which include the Ekpo, Abang, Edeme Awan Nkwho, Ekon, Afikegit, Konkoma, Mbok, Ababa, Nnabo and many others. The Oron people have a very colourful mode of traditional dressing, especially with an Iyara (which is red in colour). The red Iyara is usually worn with a white tailored traditional shirt and a wrapper to match and combined with the rich Efik native piece of cloth (tie) , usually colourful silk material. 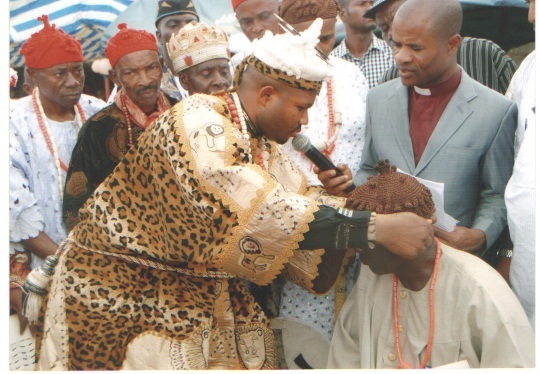 OBONG UFORO: This traditional chieftaincy title of honour means "Chief of Progress or Development". The Title is conferred on prominent sons of the land who have through exceptional acts and commitment have brought progress and development to the people of the land. OBONG UNWANA: This traditional chieftaincy title of honour means "Chief of Light". The Title is conferred on worthy sons of the land who have through various acts of selfless service and dedication brought civilization, enlightenment and emancipation from darkness and ignorance to the people. OBONG IFIOK: This is a traditional chieftaincy of honour with a royal office as Royal Special Adviser to the Traditional Council. The Title means "Chief of Knowledge". It is conferred on very highly educated and knowledgeable sons of the land, who have, through their accomplishments in the field of knowledge and education become a source of knowledge, wisdom, informed opinion, enlightenment and shining enigma to the community. OBONG IBEREDEM: This is a traditional chieftaincy of honour which means "Chief of Support". It is usually conferred on people who have through outstanding acts of selfless service brought great support, assistance and help to the people of the community. OBONG EMEM: This is a traditional chieftaincy with a royal office as Royal Peace and Conflict Resolution mandate of the Traditional Council. The Title means "Chief of Peace". It is conferred on worthy sons of the land who have distinguished themselves by actions and character on the entrenchment and sustenance of peace. OTU-EKONG OR OBONG EKONG: This is a traditional chieftaincy title office which means "Chief of War or War Lord". The occupant of the office is the commander of the host of war of the community. The title is conferred on worthy noble sons of the of the land who are from the family to which the office reside in some communities. In other communities, the title is conferred on noble and worthy sons who have through exceptional acts of bravery attained great heights in various fields and have used such accomplishment to liberate the people from various forms of enslavements. OBONG INYANG OR UKARA-AKPA: This is a traditional chieftaincy title office which means "Chief or Ruler of the Seas". The occupant of the office is a commander of the Host of the Seas who is responsible for the defence of the territorial integrity of the community on the seas and the protection of the community from calamities or invasion from the seas. The title is usually conferred on worthy sons from the family to which the office resides in some communities. In other communities it is conferred on worthy sons of the land. MKPISONG : This is a royal traditional chieftaincy title which means "Royals of the Land or Prince of the Land". This title is usually conferred on great princes of the community who have through exceptional acts of bravery and courage brought glory and honour to the land. ADAHA: This traditional title means "Pillar". The title is usually conferred on worthy sons of the land who have though acts of courage in the face of grave danger, bravery, perseverance and absolute loyalty sustained the sovereignty and greatness of the community. OBONG OFUM OR EKPE-ENYONG: This traditional Title office means "Ruler of the Air or Lion of the Sky". The title is conferred on worthy sons of the land from the family to which the office reside. In other Communities, the Title is conferred on prominent sons of the land who are through great feat, protected the people from danger and disgrace. ETE-IDUNG: This is a traditional rulership office/title which was introduced in 1990 consequent upon the creation of new villages and clans and the classification of some Traditional Rulers in Akwa Ibom State through the enactment of the Akwa Ibom State Traditional Rulers Law, cap 134 of 17th May, 1990. By that action, new villages and clans which did not have royal traditional thrones/stools were created and there was the need for these villages to be traditionally administered. The Office/Title of Ete-Idung which means "Father of the Village" was therefore created for the new Village Heads to occupy and function thereto. NKUKU: This is Royal Traditional Rulership and Priestly Office/Throne which exist in Annang and some Communities in Ibibio land. It is an ancient traditional throne/stool which had existed from the ancient ages. This Office/throne traditionally ascended by inheritance in many communities of Annang and Ibibio land. In other communities, the royal house elects worthy prince from amongst the ruling house to occupy the throne/office. The Nkuku occupies both the Kingship and Priesthood Royal Traditional Throne/Office and performs the functions thereto. OFFONG (IVONG OR IFONG) AFAHA: This is an Oron royal traditional rulership office/stool which are occupied by the various clan Heads of the Oron nation. The Ofong is a Member of the Oron Council of Traditional Rulers presided over by the Ahta Oro. The Offong of the Afahas of the Oron nation occupies dual offices/thrones as royal tradional rulers and priests of their respective clans. OBONG IKPAISONG: The Obong IKpaisong is a Priest-King who occupies a dual Royal Traditional Rulership and Priesthood Throne/Office. The Obong Ikpaisong Throne/Office had existed from the ancient ages in Ibibio land and society as the constitutional and religious Ruler of Ibibio people in their communities. The Royal Traditional Rulership Office Title "Obong Ikpaisong" means "Ruler of the Land and the Principalities of the Land or Ruler of the Land and the Host of the Land". The Throne/Office of Obong Ikpaisong is the highest Royal Traditional Royalty/Priesthood and Title in any autonomous Ibibio Community from the ancient times. AHTA ORO: This is the Supreme Royal Traditional Rulership Throne/Office in Oron nation. The Ahta Oron is a dual office traditional monarch which is the constitutional Ruler of the Oron nation and the Royal Traditional Priest of Oron land. The Attah Oro rules with other paramount Rulers of the five local governments of the Oron nation together with the Clans Heads (ofong of the Afaha). The other prominent Title Ch iefs such as Ikpoto, Okete Okete are also recognized by the Ahta Council of Traditional Rulers of the Oron nation. The Ahta Oro Traditional Office, though unclassified by the Akwa Ibom State Traditional Rulers law, is occupied by one of the Paramount Rulers of the Local Governments of Oron land who on ascension to the throne becomes the Supreme monarch of the Oron nation. However, by the definition of the Traditional Ruler by the Akwa Ibom Traditional Rulers Law, Cap 134 of 1990, the throne is within the ambits of the law as a supreme office within the areas of jurisdiction which is Oron land. THE NKUKU ANNANG/ITAI AFE ANNANG: The Nkuku Annang is the supreme royal traditional and priestly monarch of the Annang nation. The Nkuku Annang is selected from among the Paramount Traditional Rulers of any of the Annang 8 local governments to reign over the entire Annang Race. The Nkuku Annang Throne and Office though unclassified by the Akwa Ibom State Traditional Rulers law, is regarded as the sovereign Traditional monarch of the Annang nation. However, by the definition of the Traditional Ruler by the Akwa Ibom Traditional Rulers Law, Cap 134 of 1990, the throne is within the ambits of the law as a supreme office within the areas of jurisdiction which is Annang land.